IN 1939 all the world will help America celebrate the 150th anniversary of the inauguration of George Washington as first President of the United States. The event took place in New York City ,and to mark the occasion Gotham is building the greatest international exposition in annals of world fairs. Across the East River in the Borough of Queens, on Long Island, in about the geographical center of Greater New York, lie the Flushing Meadows, a 1,216-acre tract sometimes dignified by being called the Valley of the Flushing River. But Flushing River is little more than a meandering creek and much of the “valley” is so low-lying that for ages it has been simply a salt marsh and for the past 30 years part of it has been a rubbish heap. The southern portion is still very much as it must have appeared to George Washington, with wooded slopes on each side and stands of waving swamp grass on the valley floor, with little snakelike ribbons of water gleaming through. But on the northern part of the land some 300 acres have been covered with hills of ashes, rising in the highest mound, called “Mount Corona,” to a height of 90 feet. These 7,000,000 cubic yards of ashes are now being converted into fill for the fair grounds. has been completely leveled by steam shovels mining through broken bottles, rusted bathtubs and a rich mould of old garbage and the other ash hills are fast disappearing. The eight steam shovels and four dragline derricks with 70 foot booms keep 100 trucks busy moving a cubic yard of fill every two seconds. Over 300 buildings at the edges of the operations have been razed. When all this work is completed, this location will be good ground ready for landscaping; the swampy lake will be transformed into fresh water lagoons, a new channel will be dug for the meandering stream, and a dam will be built to keep out the salt water. Ten thousand large shade trees will be set out. Then will follow the realization of a glorious dream for a world’s fair. It is planned that the main core of the fair will be on the northern part of the tract in an area of 373 acres most accessible to the Long Island Railroad and to Flushing Bay. Encircling the main core of the fair grounds will be a peripheral road. The central building is the “Theme Tower,” to be 250 feet high. This is to be the highest building. All other buildings will be either one or two stories high. From the central tower will radiate broad avenues and promenades leading to the ten main exhibit zones into which the fair will be divided. The ten zones for exhibits of Clothing, Shelter, Education, Government and Co-operation, the Arts, Health, Recreation, Sustenance, Public and Social Services, and the Basic Industries, including Transportation, Communications, and Distribution, will carry out their themes, each in its own way. Each zone will have its own focal point. Eastward from the Tower is to be a series of basins and fountains, and at the far end of these will be the Plaza of Governments and the Federal Hall. The grounds are to be laid out with wide walks and roads, open spaces and recreation areas, and everywhere garden spots, fountains, and tree-shaded benches. The whole plan provides for free circulation and accommodation for huge crowds, as it is expected that 50,000,000 persons will visit the fair during the year. There will be a “Hall of Nations” to house foreign exhibits. Two of the permanent buildings will be erected by the City of New York and the State of New York. A Planetarium is planned, on the inner dome of which will be a miniature sky studded with stars and planets. Intricate machinery will move these heavens at will, to show how constellations appeared in the heavens a thousand years ago or how they will look a hundred years hence. One of the principal zones will be that of Transportation and Heavy Industries, to be located south of the Long Island Railroad tracks. Here will be enlarged railway terminals and the Administration Building, which will be one of the first buildings to be erected. Near the Administration Building will be Army and Marine camps. In the southern part of the grounds two large lagoons are being formed, and at the northern end of the larger of these is to be an amusement amphitheatre where visitors will be entertained by every variety of show—operas, plays, pageants, water spectacles and fireworks. The stage, flanked by two massive pylons, will be built on a semicircular island 100 feet off shore. Beneath the grandstand will be a large promenade hall and various exhibit rooms. An attempt will be made to provide new methods of entertainment, new shows such as cannot be found anywhere else. The fair is to be three times as big as Chicago’s huge show and much more gorgeous. Buildings, although of a unified design, will be of strange new colors and shapes. Colored lights, strip girls, gondolas and skyrides will be on a lavish scale. Besides the exhibits there will be athletic events, boat racing, swimming races and water sports of all kinds. The amusement section will extend for three miles along the eastern borders of the lagoon and, in addition, entertainment will be provided in the main section of the fair in the ten major zones. And to keep the youngsters from too much footsore sightseeing, a playground will be centrally located near the Government Plaza. Instead of one main entrance there will be nine, located to facilitate handling the crowds and to shorten the distance to transportation lines. From the entrances broad avenues will converge on the central Tower. 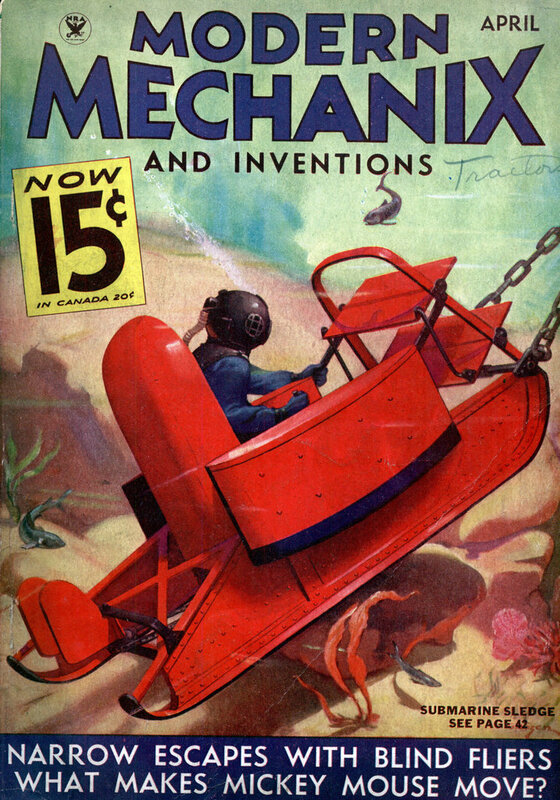 The grounds will be served by every means of transportation. Two major highways traverse the tract, one along the bay, the other through the center. Another highway runs along the west side, another at the southern end. A division of the Long Island Railroad crosses the tract, and the main line touches the southern end. Two subways already have stations on the grounds, and a spur from a third subway will enter the grounds from the south. Flushing Bay will be dredged for water craft. As a part of the increased transportation facilities, the improvement of this bay is ranked among the most important as an ideal water gateway to the fair. If a deep enough channel can be provided, ocean liners will dock right at the gate. There will be a boat basin and planes ‘may come down there, or land at nearby airports. Parking space for 30,000 automobiles daily will be provided, and bus terminals will be able to care for 50,000 passengers. There is also to be a trailer camp, to take care of thousands on homes on wheels. 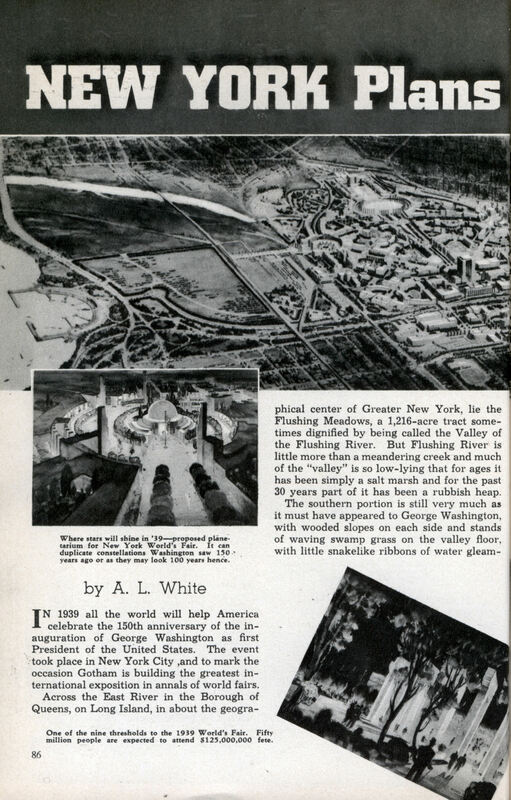 The New York World’s Fair will open its gates on April 30,1939, and after its grounds have served the purposes of the fair, New York City will get a new and beautiful park with groves and gardens and such basic improvements as roads, bridges, sewers, lights, and some permanent buildings. Meanwhile, work goes on to provide amusement, thrills and a glimpse of things you never even thought of before.